“The world’s fastest half-marathon” - as the organizers of the Ras Al Khaimah race describe the event - has lived up to its billing in 2017, with Kenyan runner Peres Jepchirchir setting a new women’s world record of 65:06 for the distance in the emirate in February. Jepchirchir took three seconds off the previous women’s half-marathon world record, which was set by fellow-Kenyan Florence Kiplagat in Barcelona two years ago, and held off the best efforts of Mary Keitany, who has won in Ras Al Khaimah three times and is herself a former world-record holder. But this year, Keitany could only manage second to Jepchirchir, despite recording a personal best, and coming very close to beating Kiplagat’s old record as well. The nine elite women set off just after 6:45am, fifteen minutes before the male elite and mass starts, led out by two male pace-makers, who had been instructed to set a 66-minute race pace. In the half-light of the early morning, they embarked on the course through the streets of the low-rise, modestly-sized city of Ras Al Khaimah. Just beyond the city loomed the stark Hajar mountain range. Within a few kilometers, a group of three - Jepchirchir, Keitany and the relatively inexperienced Joyciline Jepkosgei, also of Kenya - had pulled away from the rest of the group, accompanied by one of the male pace-makers. At the 15km mark, the three women were still together, with Keitany leading by a second or two, but then Jepchirchir began to take control. By 18km, where there is a turn into the final stretch of the course, Jepchirchir had pulled ahead of Keitany by 20 meters or so, and Keitany was unable to prevent the gap from widening over the final three kilometers. Jepchirchir looked ragged in the final few hundred meters and collapsed after crossing the finish line, but fortunately seemed to recover quickly. Remarkably, Jepchirchir’s win came not long after she had suffered from pneumonia, which affected her for two months at the end of 2016. But illness aside, Jepchirchir’s progress over the past couple of years is evident: She won a string of races in France in 2014; was fourth in last year’s Ras Al Khaimah half; and she is the IAAF’s reigning female half-marathon world champion, having won the IAAF race in Cardiff in March 2016. Before the Ras Al Khaimah race, the organisers said that they had put together the strongest women’s half-marathon field ever assembled. But the men’s field had class as well. Twelve of the elite men came to Ras Al Khaimah with half-marathon bests under 60 minutes. By 10km, a group of four men had broken away at the front, and were setting a blistering pace, though slightly off that required for a world record. At the 18km turning point, that lead group was down to three runners, with Kenyan Augustine Choge and his compatriot Bidan Karoki duelling for the front spot. With about 1500m to go, Karoki ratcheted up the pace and surged for the line. Choge had already faded to third. Yigrem Demelash of Ethiopia, now in second, was unable to keep up with Karoki, but held onto his position. Karoki won in a time of 59:10, with all of the first four runners finishing in less than an hour. To put that in perspective, until the Ras Al Khaimah race, the fastest half-marathon time of 2017 had been the 60:00 recorded by Scotland’s Callum Hawkins in Japan in the first week of February. Hawkins’ time was a Scottish record for the half-marathon. Elite half-marathoners are running at a formidable pace: Karoki’s average pace in Ras Al Khaimah was 2:48 per kilometer. Many good amateur runners would struggle to do just one kilometer at that speed. 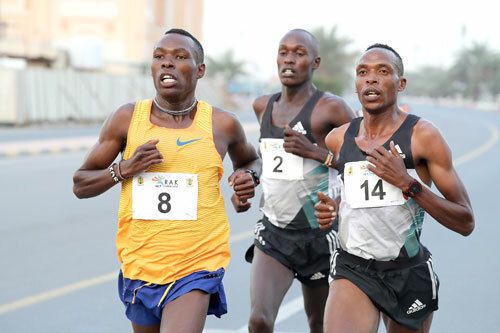 Among UAE-based runners, Ugandan Ismail Ssenyange recorded a highly impressive 65:11 in Ras Al Khaimah, coming in 19th place overall (18th-placed man). Finland’s Anne-Mari Hyrylainen was also excellent, finishing as the ninth-placed woman in a time of 72:39. Briton Emily Waugh, who moved from the UK to Dubai a few months ago and has already established herself as one of the quickest women on the local running scene, was the 14th-placed woman in Ras Al Khaimah, finishing in a time of 80:32. Not all of us can be elites, or even make it into in the higher ranks of the amateur runners. But for all runners there are personal targets, PBs, and perhaps category prizes, such as Masters or Veterans, to chase; as well as the enjoyment that comes from taking part in a well-organized event like this. As an amateur it is inspiring to run in a race in which a new world record is set, even if the action takes place a few kilometers ahead of you on the course. But how is that a world-class running event is taking place in Ras Al Khaimah, a place that - unlike fellow emirates Abu Dhabi and Dubai - is little known beyond this region? In part it has come about because the Ras Al Khaimah authorities are keen to raise awareness of the emirate, increase the number of visitors, and develop a number of economic sectors including tourism. As a result, Premier Online, the company that organizes the Ras Al Khaimah half-marathon, found a willing partner in the local government when it set out to hold the race for the first time, in February 2007. (The 2017 race was the 11th edition.) Nathan Clayton, the managing director of Premier Online and Race Director of the Ras Al Khaimah half-marathon, had earlier co-founded the Beirut Marathon. Premier Online also provides e-commerce and timing services to other sporting events across the Middle East. Clayton had contacts in the world of elite running, and expertise in organizing races. Ras Al Khaimah offered a flat, fast course, at the coolest time of year in the UAE, and at a point in the international running calendar when elites are looking for an opportunity to test themselves ahead of events such as the London marathon, which is held in April. A further attraction is that there is good prize money on offer. This year, Jepchirchir picked up a bonus of AED365,000 - or nearly $100,000 - for the new world record, as well as AED50,000 for the win and AED18,000 for setting a new course record. For all of these reasons, the event quickly established itself as a popular one with elites. There have been some outstanding performances in previous years too. Kenyan Samuel Wanjiru set a new world record in the inaugural Ras Al Khaimah Half-Marathon, in 2007. He went on to win gold in the men's marathon at the Beijing Olympics in 2008. (Tragically, Wanjiru died in 2011, aged only 24, after leaping from the balcony of his home in Kenya during a domestic dispute.) Mary Keitany set a women’s half-marathon world record in Ras Al Khaimah in 2011. The event is also popular with amateur runners, based in the UAE and beyond, with about 2,000 taking part every year. The fast course offers everyone a good chance of a PB. There is the excitement of taking part in a race with some of the best runners in the world. And the Ras Al Khaimah half-marathon is extremely well organized, by professionals who understand running and know how to put on running events. Although the Ras Al Khaimah half-marathon is now well-established, Jepchirchir’s new world record will further strengthen the prestige of the race, which should help the organizers to continue to attract a strong elite field, and to develop the event further. And, one hopes, the presence in the UAE of a race of this caliber and international standing, will continue to energize locally-based runners. The Ras Al Khaimah Half-Marathon usually takes place in mid-February. The 2018 race is scheduled for February 9th. Registration for the 2018 race will open on the 1st of April 2017, with individual entry costing AED200 for early bookings, climbing to AED350 for later bookings. The cost of entering a team of four in the relay that takes place alongside the main run will range from AED800 to AED1400. Ras Al Khaimah is the northernmost of the UAE’s seven emirates, about 90 minutes’ drive from Dubai.